I post this information to caution everyone that thinks they are going to dump Viasat and move to the Verizon Prepaid Unlimited Plan. Not all cell towers are created equal!!!! Last night I tested the tower my home receives. Got about 1.5 Mbps. Today, I tested off the tower in town. 29.2Mbps. Both are Verizon towers, but the performance of one is no better than what Viasat can deliver. While I considered playing around more with this prepaid unlimited plan, it just is not going to give the performance I need at home. So for those of you that want to make the move, do a few speed tests. You might be no better off than what you already have. As the old saying goes, better to dance with the devil you know, and not the devil you dont know. Now, back to riveting tractor talk! ABSOLUTELY agree with you. For anyone that has good Verizon or ATT service, I think the jetpak option could be the way to go, as described in the recent thread "viasat 1 customers under attack". For those of us with minimal Verizon service, definitely don't do it until you have a side by side test. You might be out a couple of hundred bucks on the device, but better that than be screwed with your internet speeds. My verizon service is also different between winter, no foliage on trees, and summer/fall when everything is fully loaded. Verizon has a reputation of changing the data management also. There is nothing to protect you with this new "unlimited" prepaid plan not being throttled in the future. Having no contract means Verizon is complete control. Even when you have a contract, does it matter :). There are a lot of towers in the middle of nowhere that are not connected to a strong internet backbone. Edit: Maybe they even deliberately give more bandwidth to towers nearer to populations centers in comparison to those in the boonies. No doubt MVNOs can throttle users plans, and no doubt wireless companies can determine performance tiers for pre and post paid accounts. If max speed from your tower for unlimited prepaid is 1.5 Mbps, that is close to what my Samsung S8 was throttled at various test sites, in big/little cities and local tower used, on PagePlus. Always 1.7Mbps, with LOS of VZW towers, or even seven miles away LOS. But uploads were off the charts. My flip-phone was locked-in around 4Mbps on Fast.com, which I suspect Pageplus evaluates all cellphone usage patterns, and then clamps down on expected bandwidth hogs. Your speed of 29.2Mbps elsewhere suggests your home tower may not have fiber, and may use microwave or POTs. My home VZW tower is hooked to fiber, and postpaid VZW users can get much higher speeds than your 29.2Mbps, but on Pageplus, its about 4Mbps on flip-phone, and 1.7Mbps on S8 smartphone. I know my local tower uses microwave. I can see the dish on the side of the tower. My tower is basically a relay to another tower. Good for texting, phone. basic browsing. Not good for streaming or competing with satellite internet. Yes, the tower is 7 miles away and it is a new tower just put up 3 months ago. Most people around can't get the signal at all cause of the mountains block them, I live on top of the big mountain here and I get full bars. I do get speeds slower than that I just did but hardly under 30 or 40 and that is on weekends only. I just keep Vaisat to record my shows and Verizon to game like I have said on other posts. Like has been said I know Verizon could change the plan if they want so I will keep Viasat for time being. My latencey is 17 most of the time. Thing is when I fist got Verizon my speeds topped off at 40mbps the a week or so ago I started getting those crazy high speeds well crazy fast for me at least. Yep. The latency. Satellite internet's high latency in and of itself is a bit of a problem, but when there is virtually no congestion it's not really an issue. Mix congestion in there and the two problems compound each other with streaming. Get rid of one or the other and you're often okay. With very low latency your streaming is likely to be pretty good, even when your speeds get to being borderline enough, and even when that's not the case with ViaSat, again, because of the congestion and high latency combined. I probably didn't say it every time, but I tried to say "if your tower isn't congested", at least once in a while (plus you need a signal obviously). The Verizon tower I'm pointed at is on fiber, don't know about the new one 13 miles away, don't get that way often. It would be on a different line if it was. Just caught that...how about latency? How many ms via Fast.com? @jab, so many variables, tower load, terrain/trees etc. from the tower to house, ...interference. Tower load could be the big one. "up to" clarification, definitely. Provider can say "up to" 100 meg, and the customer doesn't see more than 5 90% of the time. The DSL provider in the village also advertises "up to" 5 meg. Although understandably, end of the line, 8 miles out, doesn't work well enough to stream audio. Lots of variables with speed, but if somehow they could come up with ~realistic numbers that people would see most of the time, instead of rarely. Something odd the last couple tests. Bit before 10 now. But upload spikes at about 70 meg, and holds for about 3 seconds, then settles over another couple seconds down to this. Higher than average upload. When I get time, and I see this plan will "be around a while", I will have to do some more equipment testing. Yes, many variables....but VZW's programming may not be uniform across all of their network operation centers. I would suspect they monitor traffic, adjust traffic policies. But, in @Vet's case, it appears they have locked down speed, despite their plan being High Speed. I understand limited bandwidth for a rural tower, but when loads are light, there should be no throttling on this unlimited plan. Hence, programming SNAFU, or some technical reason. VZW's latency at "my" local tower is 127ms plus....due to its traffic being routed to Denver, some 400 miles away. But, when you consider how many towers they must evaluate....I suspect screwing the pooch is nothing new under the sun. AT&T, Verizon, ViaSat, and others screw the technical pooch. Viasat has made a good faith effort, imho, of getting their system fine tuned...but engineers at big telcos may not be as motivated. And if you try to get a big telco's attention, about a programming issue...fat chance. Just like trying to talk to Master Card or Visa...you get CSR peons. I found an IP issue with AT&T....you know, those "reach out and touch someone folks," well no response. Viasat, on the other hand, does listen, and will take action...they usually don't talk, but they do monitor two forums. Who you going to talk to with big wireless carriers. I dont think it is intentional throttling, I just think not all towers are created equal. That's probably true. It is odd if you don't see the faster speeds during non-primetime. But, it is what it is, an option for some. Today, uploads still averaging faster, and sustaining crazy fast for a few seconds. Don't know what's going on there, and why just the uploads. Let's not forget about old Liberty, she is running slow tonight but I blame Stephen Rice for taking up the bandwidth during his pizza party. Stephen us on the magic beam. Others are penalized so Stephen can get more than he paid for. This forum is just a fraction of complaints about the plan changes. I can imagine how this is going with phone support. 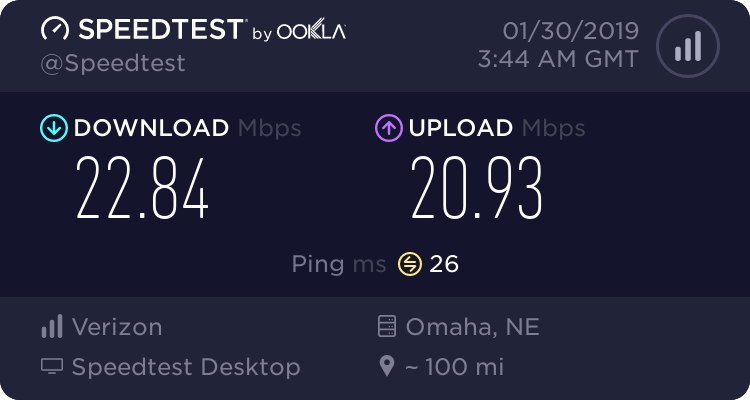 My Verizon speeds are 5-10 mbs most of the time. VIASAT was rarely that fast and VIASAT constantly dropped out even without the weather issues. 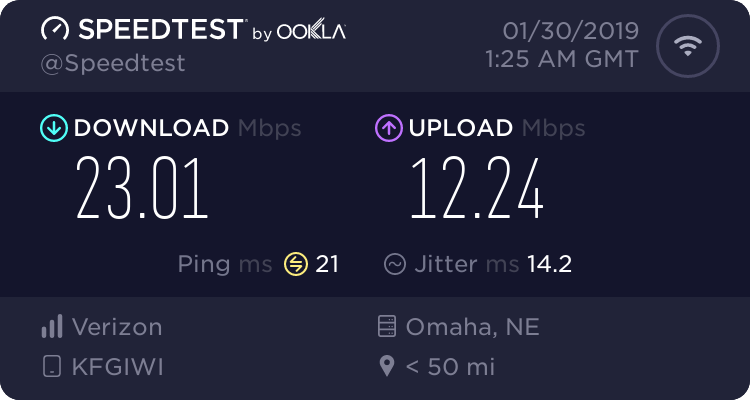 If VIASAT had been a steady 2mbs + and never dropped I probably would have never tried Verizon as their call service in my area isn't anything to brag about. This may be off topic a bit but would like to point out about the diff in 1080p and 4k for ones wishing we could stream 4k on Verizon or any isp. Your not going to see any difference tbh I know I can't my eyes are not as good as they once was. I have a nice 4k tv and a 4k player that I paid a nice penny for and for only difference my eyes could see sitting up close to the tv was the images was just a tad sharper is all. I just think the 4k era is just a waist of money since your eyes can't tell that much difference, even done some research on it and experts say the same. Just thought I would point that out so if you was wondering if 4k is that big of a deal. Well being that most Viasat plans cant even deliver true HD (1080p), let's worry about getting above 480 before we even think about 4K. BTW, I can tell a difference. But I agree, many cannot. The only time I've been able to see a difference between 1080p and 4K was on a 70 inch TV. On my 43 inch Sony Bravia I cannot tell any difference in picture quality. The table below gives the optimal viewing distances for 4K and 1080p TVs. That said....one would have to use a true 4k played via disc...not cable/LTE/etc. Just like "DVD" quality can only be obtained via DVD disc. Internet broadcasted video tends to be the "lite" version, which started many years ago with HBO video. Yes, 4K is marketing hype overall, but 4K HDR (High Dynamic Range) can make a difference. 2.9 feet for a 43" TV? Who in the heck is going to sit 2.9 feet away from their TV? SMH. I'm sitting 10 feet away with 1080p. I see it references the ridiculous closeness below the table. "Some may find the optimal distance uncomfortably close." Gee... ya think?